We are well known as a leading suppliers of high quality carton sealing and taping machines. We have our machines that are technically advanced. 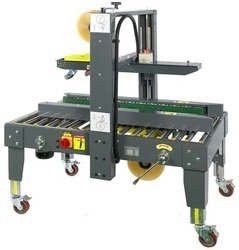 Our carton sealing and taping machines are available in the market at leading prices. Our Catron Sealing and Taping Machines are high performing in their nature. We are looking for customers from South India like Andhra Pradesh, Tamil Nadu, Kerela, Karnataka etc. Durapak is known as one of the most leading suppliers of high quality carton sealing and taping machines. 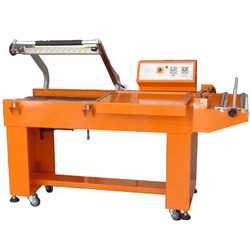 different types of our technically advanced carton sealing and taping machines are available at market leading prices if you are searching high performance carton sealing machine for your specific requirements. new taping head incorporating a v shaped plate (patented) designed to keep the tape straight and in position for consistent sealing of every carton. This design is superior to previous blower devices. flexible cushion prevents box been jammed under the top tapping head. tape overlap length can be adjusted from 55~65 mm, tape overlap of 70+-5 or 90+-5mm can be provided on request. wider belt-75mm firmly seize the carton, new "linking buckle" design allowing the belt to be changed easily. over sized drive rollers guide belt design stops slipping and prolongs belt life. aluminum guide mechanism allow tape head bracket to move very stable and smooth. both side guide rails can be adjusted separately to meet the carton width. L-Sealers offered provide for proven and reliable performance and come designed to offer positive sealing support using different film types like PVC, polyolefin, polyethylene and others. Further, these machine feature use of steel frame finish to provide consistent working support in shrink wrap applications. Some of its features include seal head casting equipped with head return cylinder; stainless steel film clamps for holding film in place while sealing; dual locking magnet clamps support application for even pressure across seal bar; adjustable dwell time for better seal control; adjustable analog temperature control for handling variety of films. Looking for Carton Sealing And Taping Machines ?